I received a blender from Vitamix as compensation for this post. All text and opinions are my own. Thank you for supporting the brands that support foodfashionandfun.com! Unsweetened ice tea is one of my favorite drinks. I keep it chilled in the refrigerator so that I can sip on it all day. I like the spiciness of Chai during the winter. 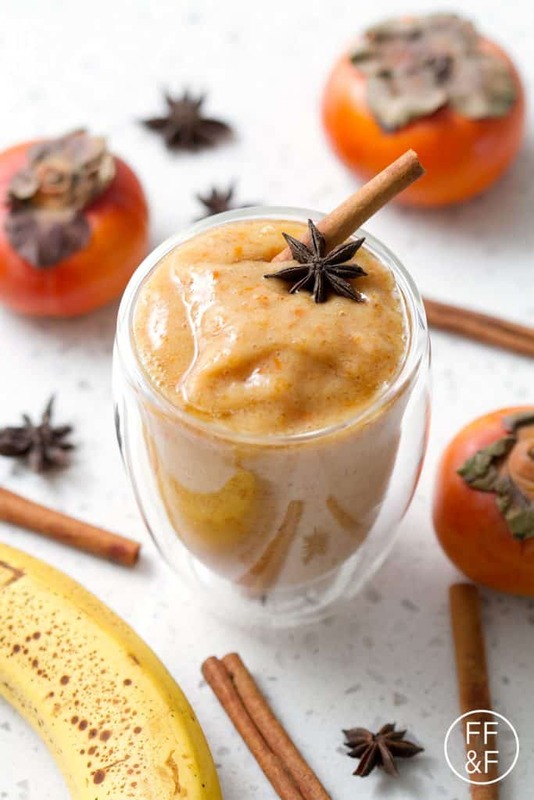 It has tons of winter spices like cinnamon and star anise so it goes really well in this Persimmon Chai Smoothie alongside bananas, persimmons and maple syrup. We drink a lot of smoothies around here so I keep frozen bananas in the freezer. 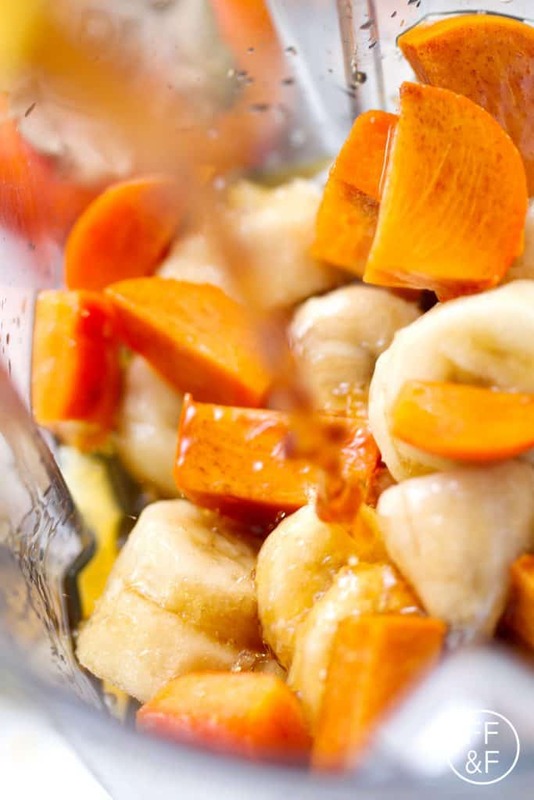 If you’re anything like me than the prep is really simple for this smoothie. You just pull the frozen bananas out of the freezer and the cold tea from the fridge. 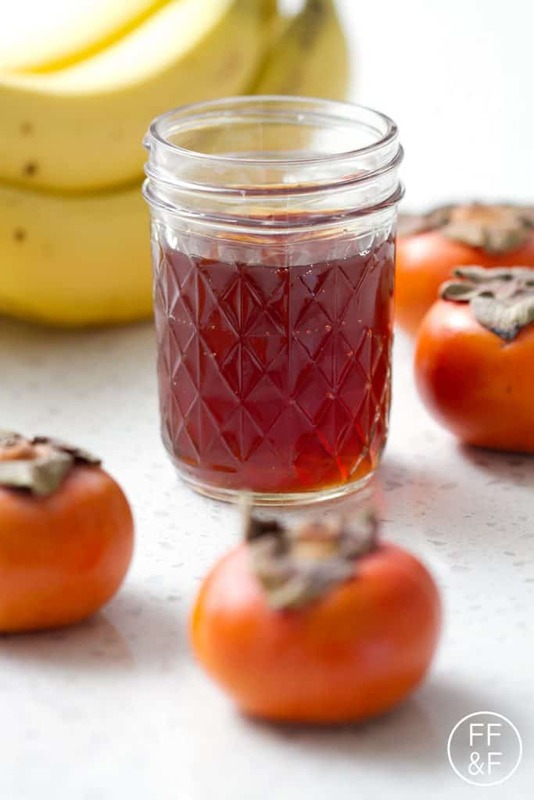 All you really need is a ripe Fuyu persimmon and you’re good to go. 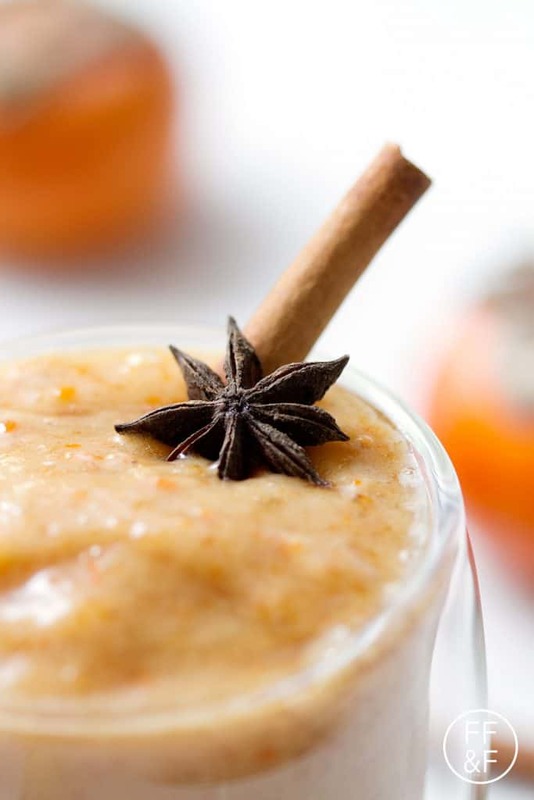 This smoothie couldn’t be much easier. 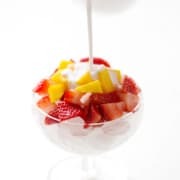 I talk about freezing fruit for smoothies in my Skillshare class called ‘How to Make Healthy and Delicious Smoothies.’ If you’re looking for more information about making smoothies and new recipes, you can find it over at Skillshare. 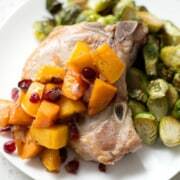 I used my trusty Vitamix blender for this recipe. I’ve actually been using the blender for lot more than just smoothies. 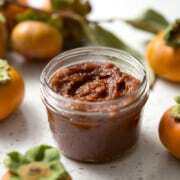 I’ve used in for my Slow Cooker Applesauce, Vegan Basil Pesto, Spicy Persimmon Sparkler and all the baby food I’ve been making. It’s a wonderful blender and highly recommend it. 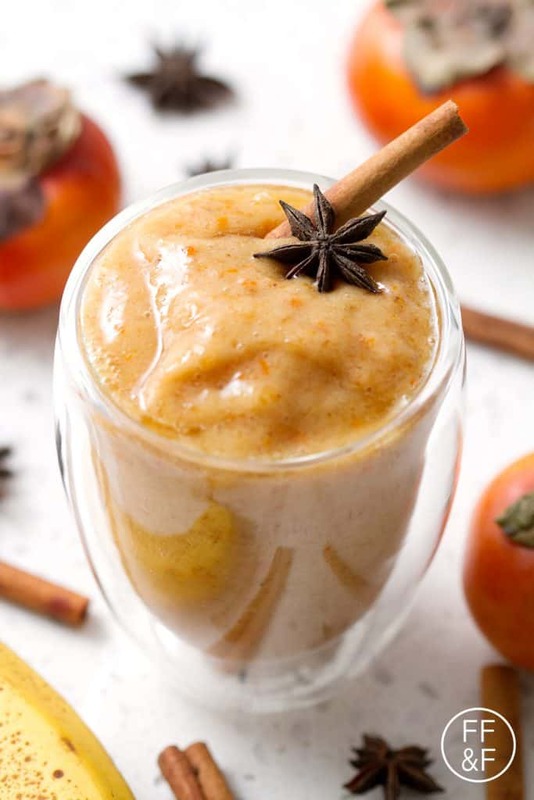 This recipe for Persimmon Chai Smoothie use uses only a few ingredients to create a healthy and delicious drink. 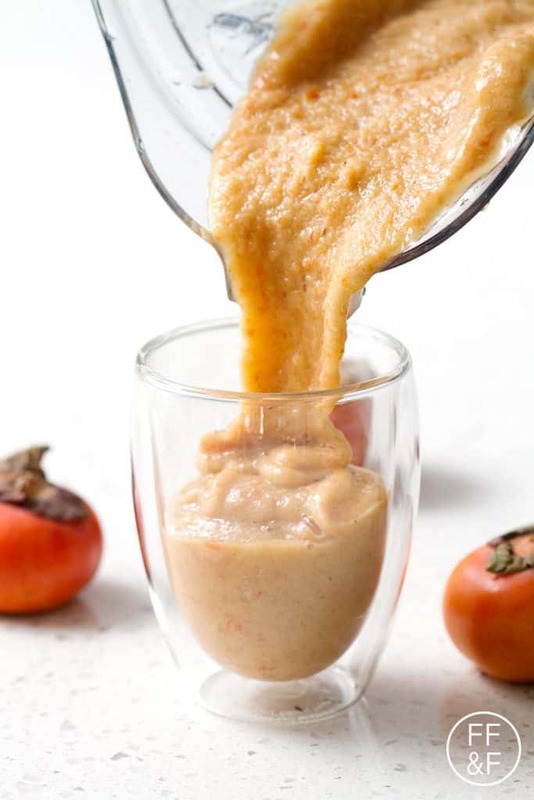 Persimmons have a rather short season so take advantage and blend this seasonal smoothie. This drink is vegan and paleo/AIP. 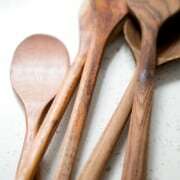 If you have frozen bananas and chilled chai tea ready to go then your prep time will only be 10 minutes.